Lillie is having a difficult year. She's still struggling with her mother's recent death, and now her father has moved the family to the other side of town. 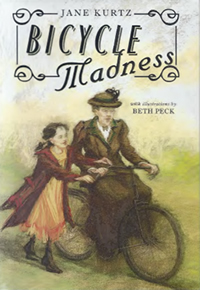 But when Frances Willard-Lillie's new neighbor-decides to learn how to ride a bicycle, Lillie finds promising change all around her. Even though her father disapproves of their progressive neighbor, Lillie and Miss Frances soon become friends. Miss Frances is involved in more than taming a wild bike, however; she is part of Susan B. Anthony's circle, fighting for the right for women to vote, as well as child-labor laws and better conditions for workers. Together, Lillie and Miss Frances take on their beasts-a bike and a daunting spelling bee-and find the will to dust themselves off, get back up, and ride for all they're worth. Set in the late 1800s, this engaging novel skillfully blends fine storytelling with women's history. © Beth Peck Illustrations All Rights Reserved.